A hand injury, such as losing a finger, is a dreadful thing. But I recently learned that it could also be a "blessing in disguise." It was a power tool that chopped off Charles' index finger on his right (active) hand while he was building a cabinet with his son. As they always say: "it happened so quickly...", then no more finger. When I heard the news, I was horrified. However, Charles' reaction wasn't what I had expected. He seemed so serene about the whole thing, when he could have been angry and resentful. This is when I contacted Kathy, my palmistry teacher, to tell her that my friend had suffered a hand injury and had lost his Jupiter finger (index finger). I was interested in her words of wisdom regarding the event and Charles' reaction. "Sometimes nature works in a way to help us work out our karma," Kathy wrote back. "Maybe some karma was spared your friend by the noble Jupiter finger sacrificing itself." Charles used to be a dynamic, highly paid corporate executive, totally enamored of his business career, until a messy divorce forced him to face the truth. He realized he wasn't happy and started to look for a deeper meaning of life. This process led him to write and publish several self-help books as well as teach seminars. Something was missing though. He had difficulties dealing with his second wife and his family members, and he attracted very little income. Charles was very much aware of the problems caused by an unbending ego that stands in the way of humility and simple joys, but he was unable to apply this concept to his own life and relationships, and he suffered from it. 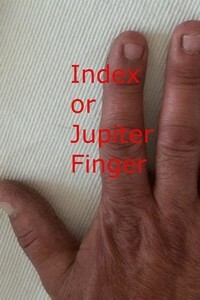 In the hand, the Jupiter finger stands for our sense of purpose, our ego, our ambition and our place in the world. Charles used to have a very big and dignified finger, which kept him from being humble and accepting. While he was kind and sensitive, he always had to be right. After his hand injury, Charles became a different man. His relationship with his wife and family members solidified, his income based on helping others increased, and he was finally happy. I recently saw Charles at a book signing. He was radiating love and joy. As he was moving his right hand to make a point during his presentation, I remembered his hand injury and how much he had changed, and I really understood Kathy's words when she wrote "the noble Jupiter finger sacrificing itself." When Charles lost his finger, he also lost his big ego, so that he could get in touch with his true self, be more flexible, and really apply the concepts he was trying to teach. I can now see it for myself: losing a finger can actually be a blessing in disguise.